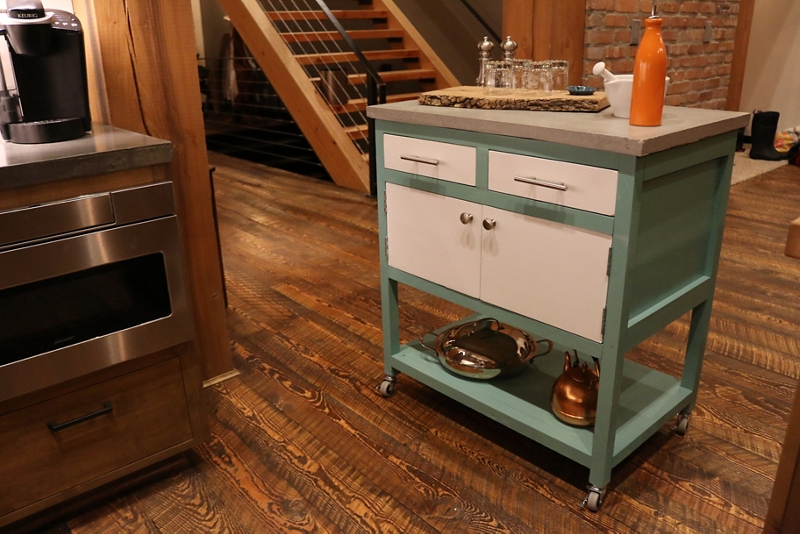 A kitchen island cart created with Krylon® satin finishes is a great way to make entertaining guests easier! First, cut all boards to size using cut list below. You’ll cut the boards using a combination of a miter saw, table saw, and circular saw. Refer to these measurements when following instructions listed below. Assemble the lower shelf by attaching the 1 ½” x 1 ½” trim to the plywood using pocket holes. Attach the shelf to the legs 1 ¼” from the bottom of the trim. Add a lower center support to strengthen the base and to provide additional support for the fence pickets which will form the lower shelf. Attach the cabinet sides flush to the top of the legs. Use pocket holes on the inside of the plywood panels to do this. Continue attaching each picket. Use a total of 6 screws for each board. Use 2 screws on each end, and 2 into the center support. There should be a small gap between each board that is close to ¼ of an inch. Attach the base of the cabinet so that its underside is flush with the bottom of the plywood sides. Add face trim for the drawer. Screw the two support boards together to create the center drawers support. Attach the support centered and flush to the top of the cabinet. Construct the drawers by using pocket holes to attach the sides and glue the thin bottom to the underside. Wait until the drawers are installed to attach the face board. Once assembled, install the drawers and drawer slides. After installing the drawers, attach the drawer faces from the inside of the drawers, making sure the faces are centered. Once the face boards are attached, hold the handles in place, mark their position, pre-drill, and then attach the handles. Install the doors and hinges. Follow the proper installation procedure for the hinges that you are using. Attach the trim all around the outside of the cabinet using a nail gun. Follow the installation instructions for the wheels that you purchased. For the pictured, project, 2” casters with a threaded stem and a t-nut in the legs were used. Build a concrete tabletop for the kitchen island cart. For the pictured project, pour a 1 ¼” thick x 21 ¾” x 33 ½” concrete top using a melamine form. Remove all hardware from the kitchen island card. Sand the surface prior to painting, and wipe surface clean when finished. Remove any hardware from the kitchen island cart. Spray paint the cart with Krylon® ColorMaster Paint + Primer – 25% More in Satin Jade. Use Krylon® ColorMaster Paint + Primer – 25% More in Satin Bright White as an accent color on the drawers and doors of the car. Once fully dry, reinstall the hardware, drawers, doors, and install the tabletop.